Windows Phone is a clean and modern mobile operating system created by Microsoft to rival the likes of Android and iPhone. Will the “Surface Phone” be a foldable cellular PC? Remember the introduction of the Lumia 950 XL, 950 and 550? Panos was pretty clear that he had only just taken over the Lumia efforts and the design of those phones (along with the Band) were things that he had inherited. 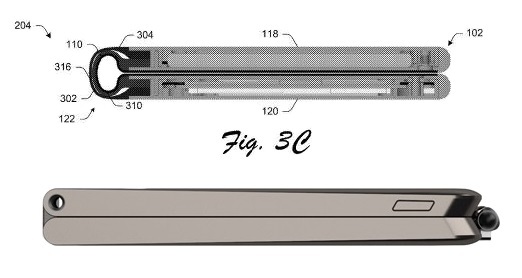 The Surface team must be working on a phone using this platform, and you can guarantee that it is going to create a new genre of devices in the same way the original Surface did for the 2 in 1. The goal is to bring Windows 10 to life in your pocket, and the recent announcements of full Windows 10 running on ARM will allow for that. This means you can have small and always connected cellular devices which can instantly switch from being a phone to being a PC. But what would something like that look like? I suggest you go to MSPoweruser and have a look for yourself – it’s very interesting. One of the images that struck me was a view of the bottom of the device. I immediately connected it to the legendary Microsoft Courier device, which was famously abandoned late in the development process. 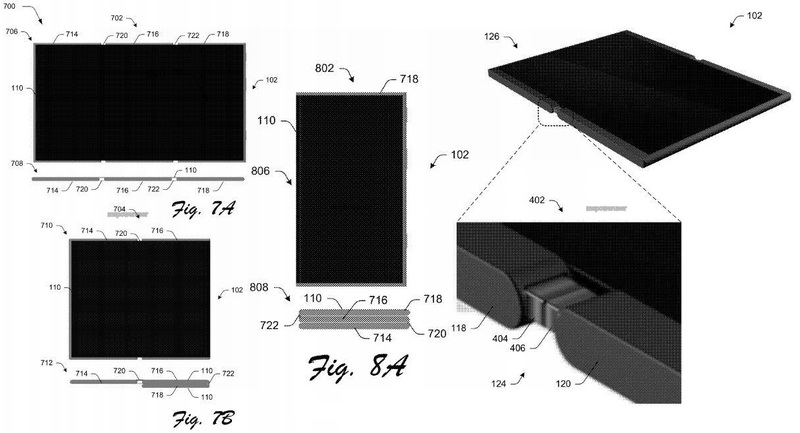 But the Courier isn’t the only foldable device we’ve seen Microsoft work on. And one of my favourites, the flexible notebook device from 2015. 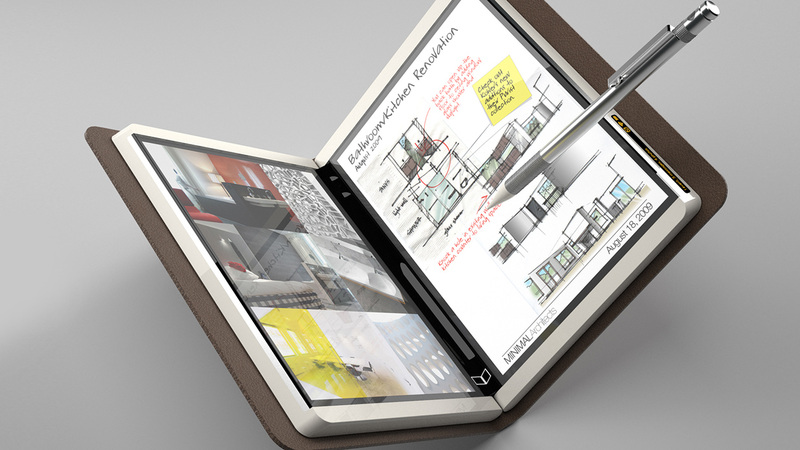 While I don’t think we’re at the stage of truly flexible computers that act like paper, I do think it’s likely that the technology is ready for a foldable device which would be able to transform between a phone and a tablet. Let’s see if Microsoft do it this year. 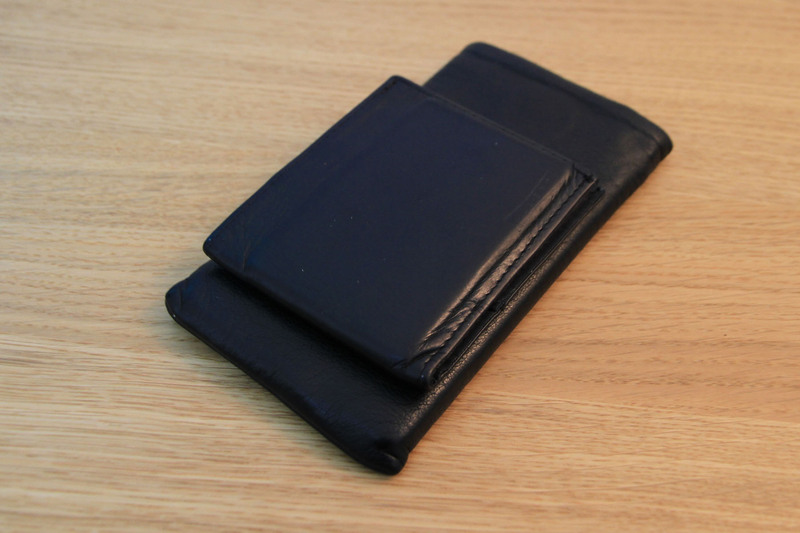 I’ve been using the same All-Ett leather sports wallet for just over four years now and I still love how small it is. I would definitely recommend this kind of wallet to someone who’s looking for something minimal. I usually carry between four and six cards, some folded money, and any receipts or note cards I have recently collected. The thought of replacing it has crossed my mind… not because it is in any way defective, but because I think I’d like to get a wallet which blocks radio signals passing through. This would block the contactless card inside from being used unless it is removed from the wallet. Of course, All-Ett do a version which is just like the one I have with the addition of this blocking technology. I’ll probably get one of these next time I feel like I need an upgrade. I’ve used Windows mobile phones for over a decade now, and I still feel most productive when I have a Windows device on me at all times. I got the Lumia 950 XL a year ago and it’s still one of the best Windows phones on the market. Yes, I know that for many people the platform isn’t moving fast enough for them, but I don’t currently have any interest in switching – most of the apps I want are already here. The top uses for my phone are productivity (Outlook, OneNote, Wunderlist), communication (Slack, Skype, Messenger), and entertainment (Groove, Audible, Pocket Casts). It has 200 GB SD card loaded up with tonnes of music and offline maps for use while driving. It’s also the the camera I use the most, and I have it synchronised with OneDrive so that everything goes up into the cloud. One of the biggest complaints about the Lumia 950 XL was that it isn’t particularly eye-catching. I tend to agree, and the standard plastic back was quickly replaced with a premium cover by Mozo. I find it makes the phone feel significantly nicer in the hand, and the real leather on the back gives the phone a warm feeling and a nice grip. As well as the Mozo cover, I also use a leather sleeve from FitBag. I mostly use this when I’m travelling or putting my phone in my bag or my jacket pocket. It protects the screen complements my leather wallet really well. I have actually found that putting the phone in the sleeve makes me less likely to check it for no real reason – when in meetings, for example. Overall I’m happy with the Lumia 950 XL for now, and I hope it’ll keep me going until Microsoft builds an ultra-portable Surface which includes ink support. Since my last every day carry post there have been two versions of Microsoft Band, and I’m currently using the Band 2. The old Fitbit got me started with health tracking, but having a device on my wrist is much better. 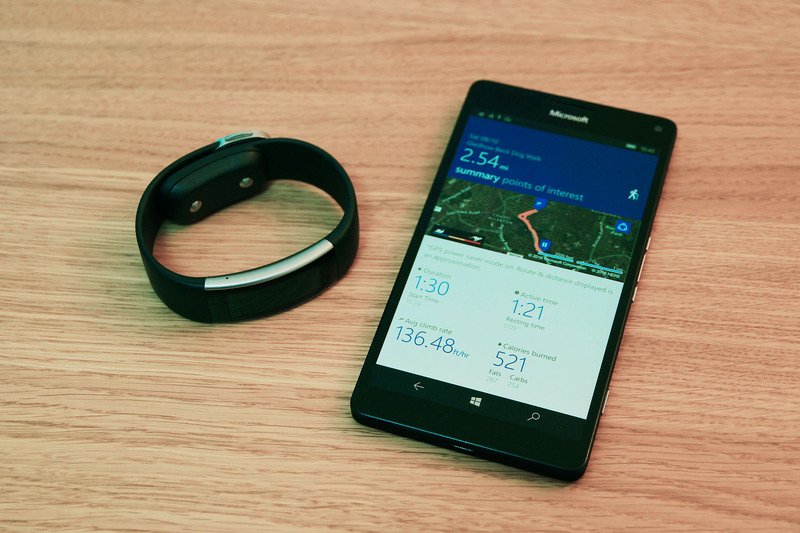 I really like the Microsoft Band, but it’s possible that this might be the last version of it. Rumours are that the Band 3 has been cancelled and there’s no replacement coming. I have a spare Band 2 to keep me going for now, and I’m just going to hope that there is a Windows-power wearable device in the works. 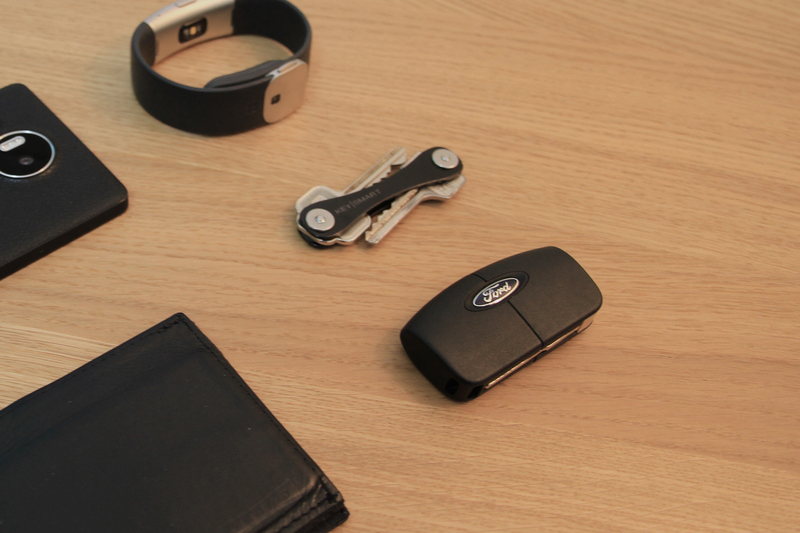 And last of all… keys. 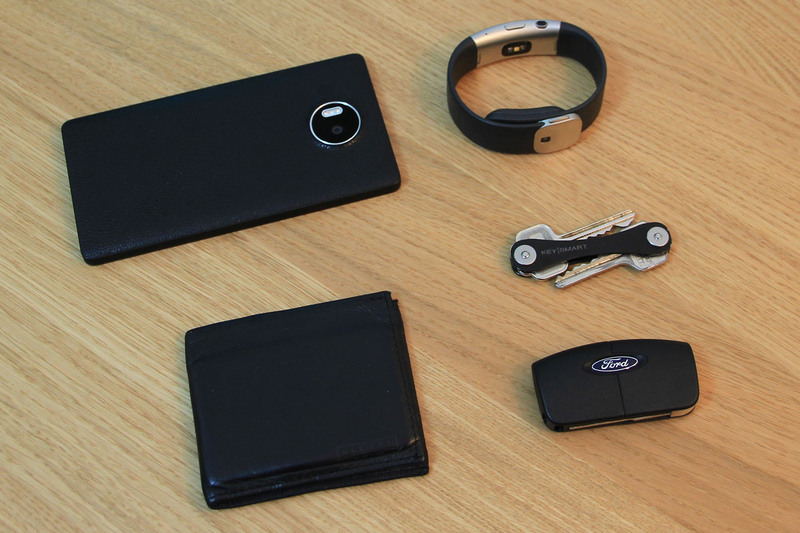 Everyone has to have some keys in their every day carry. I got a KeySmart in June last year when I moved and had the opportunity to reduce the number of keys I have to carry around. I’ve dropped it a couple of times since and they’ve been just fine – and I’ve never had them come apart in my pocket or anything like that. I love how they don’t jingle and move around when I run, but the lack of jingle also means I often double-double check I have them with me! As before, I keep them separated from my car key.